Sales are no longer the only path to gold and platinum in the music business. The Recording Industry Assn. of America, the music business trade association that certifies and issues the storied gold and platinum awards, will now hand out precious metal for digital streams of popular tracks, the first time the RIAA has created an award for anything other than retail sales. Musicians will now be able to collect gold plaques for songs that log 500,000 or more streams, platinum for those that top the 1 million mark and a multi-platinum honor for any that hit the 2 million figure. On-demand audio or video streams will be counted toward the song’s total. The first round of the new digital stream awards will be presented for 56 titles by artists including Eminem, Michael Jackson, Justin Bieber, Kansas, Whitney Houston, will.i.am., Ryan Tedder, Pitbull, Pink and One Direction. The first batch of plaques will be handed out tonight in Los Angeles to Emeli Sande, Cher Lloyd and Jason Derulo at an annual music biz conference hosted by the National Assn. of Record Merchants (NARM) and digitalmusic.org. "Getting streams included in the RIAA’s Gold and Platinum Awards certification has been a top agenda item for all of the member music services who participate in our digitalmusic.org Music Subscription Work Group,” NARM President Jim Donio said in a statement. The RIAA began handing out sales awards in 1958. 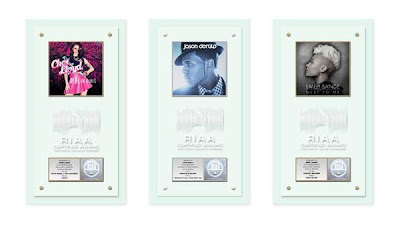 The award plaques themselves have historically included a gold, or platinum, LP, 45, cassette tape or CD, raising the question of how the new awards will represent a digital stream. The solution: a stylized representation of a sound wave. The new plaques are created by Jewel Box Platinum in Los Angeles.